Helene and I rose at 5:30 a.m. to begin the long process of dressing and packing. At high altitudes, the simple act of getting dressed gets your heart rate up into your training zone. At breakfast Bob asked what was being served. I said, "Omelets with Feta cheese, Roma tomatoes and olives." Bob said, "Really?" I said, "No, I'm kidding." He was so sad. He really wanted that to be true. But it was chilly at breakfast and the brown slop " I mean the millet porridge " was really moving. Peter taught us how to prepare it so it would be more palatable: simply drown it in sugar. Larry asked for the bag of hot chocolate powder and Helene accidentally passed him a bag of black pepper. He put it in his hot water and said, "Hmmm, this doesn't smell like hot chocolate." Then he tasted it and said, "Are you sure you passed me the hot chocolate?" When we figured out what happened, we had a hearty laugh. 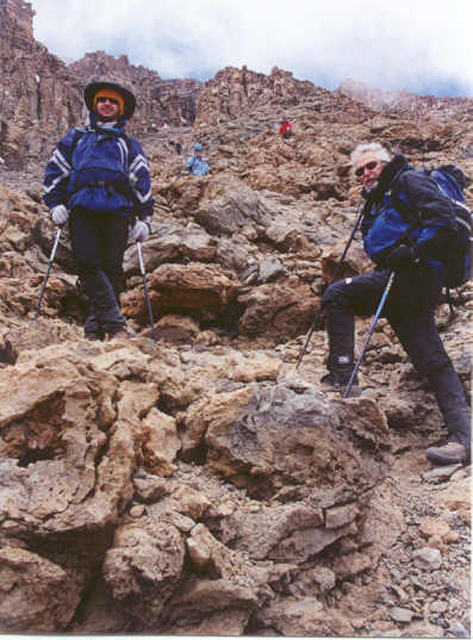 The porters charged ahead of us as usual to set up camp in the crater. 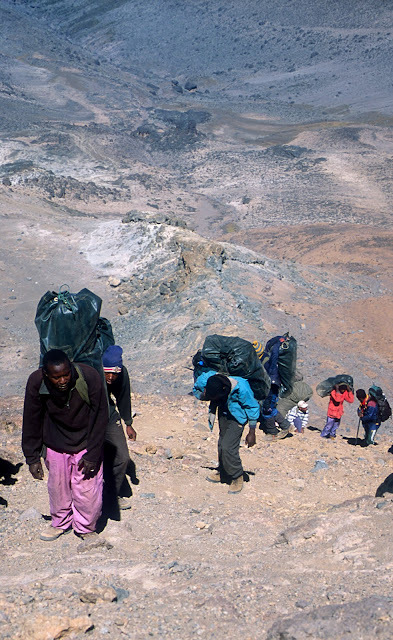 Our porters impressively carrying so much gear up the western breach. The water filters were on the blink, so we had to use iodine tablets to treat our water. Deirdre admitted that she took 4mg. of "dex." Now she was an evangelist and was trying to get Polly to take some. After breakfast, we headed slowly up the steep trail. Before long, the entire staff raced past us carrying about 20 times the weight we were carrying. We just kept on going "pollay, pollay," "slowly, slowly." For the first few hours, I wore headphones and listened to music while I did "the rest step," which is when you take one step with the right foot, then bring the left foot to meet the right foot, then you take one step forward with the left foot, then bring the right foot to meet the left foot. Either Fred or Sekeyan sent a good-sized boulder my way, but I was able to leap over it like Jack-be-nimble. Fred got nervous because he promised Ken he would bring me back alive, so Fred made me "unplug" my headphones. The hand over hand bouldering was the best part of the climb. I loved it. I couldn't wait for the next bouldering opportunity. The weather was cool and it was cloudy so there was no sun glare. It was a perfect day for mountain climbing. Every time we gained another five hundred feet of elevation, someone had a new personal altitude record. And every time we gained another five hundred feet of elevation, the views became more and more spectacular. 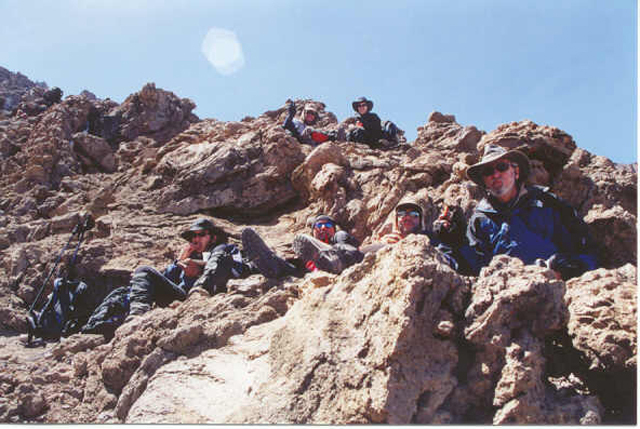 We were at the same elevation as and then higher than the rock formations that stood like sentries guarding the crater. We were well above the clouds. When I reached the lunch spot, Fred said, "Here is the Annapurna Animal." For lunch, the cooks served bread, mustard, salami, cheese, sardines, avocado, tomato, cookies and CHOCOLATE! The chocolate bar that I had chosen had seen some serious shelf life, but it was still a real treat. 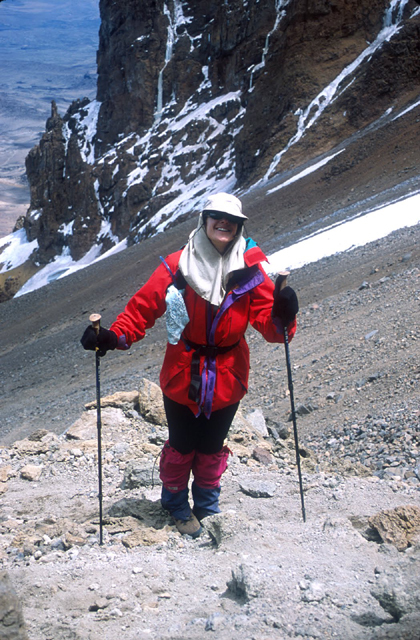 I was enjoying my new personal altitude record because we had just passed 16,500 feet (which had previously been the highest I had ever hiked, in Ladakh, India/China/Pakistan.) Bob overheard that I had been to Ladakh and we started talking about my trip there. He then added that I was doing very well on the bouldering and that I should consider attending a rock-climbing clinic at Mt. Rainier in Washington. I said, "That will have to be with husband number two." Andy added, "Or maybe BETWEEN husbands." I had to go to the bathroom and it was a major effort to find a semi-private spot and remove all my gear and layers, so I fell seriously behind the group. I was the last one to arrive at the water filter stop where Leonard and Tajiri (Swahili for "Rich") were patiently waiting. 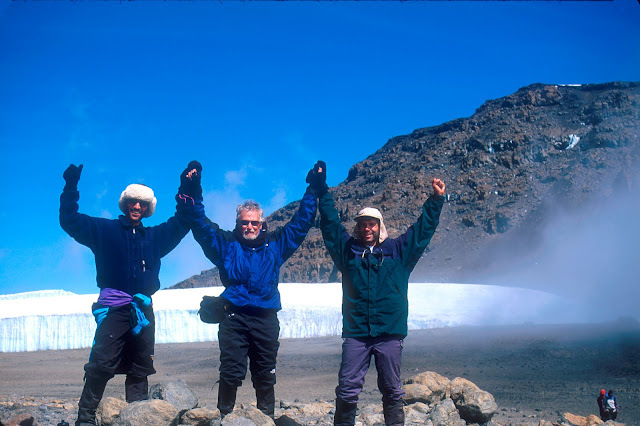 Once I had my water refilled, the three of us headed up toward the crater rim. 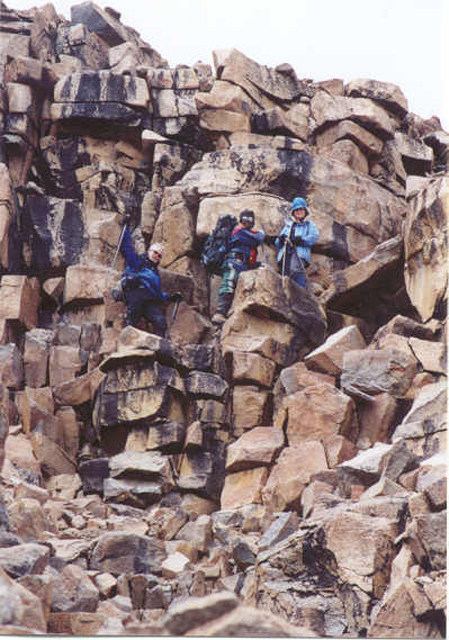 I picked up some speed on the rock wall, and just before cresting the crater rim, I caught up to the rest of the group. 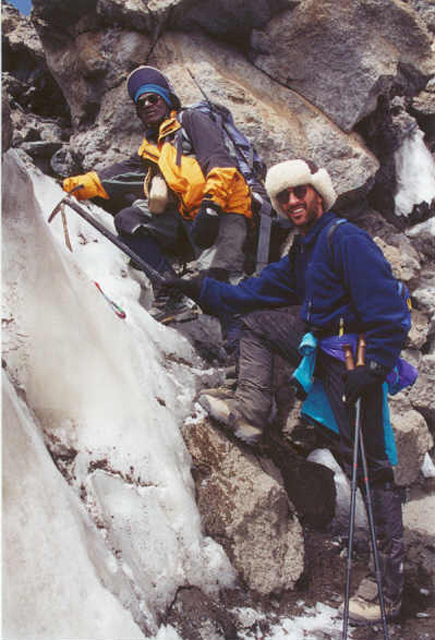 Speaking of bodily fluids, as Larry climbed the crater wall with Kapanya, he and Andy would count out each time Larry peed. Larry would proudly boast, "That's number five, Kapanya, and it is clear as water, just as you told me it should be." By the time we made it to Summit Crater Camp, Larry had peed a Perfecto 10 times! 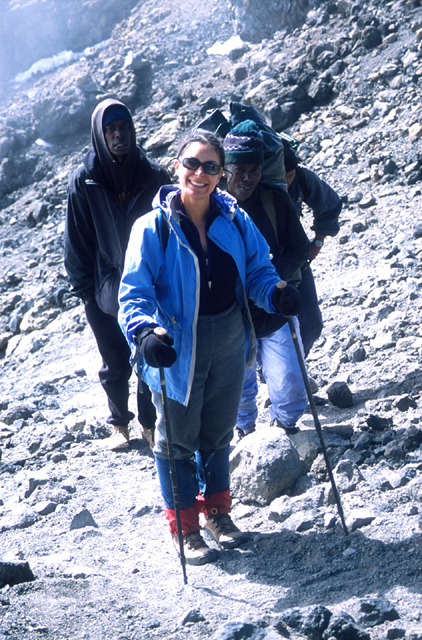 The most amazing moment of the entire trip, in my opinion, was when I crossed over the ridge into the crater. What I saw was a huge surprise to me. 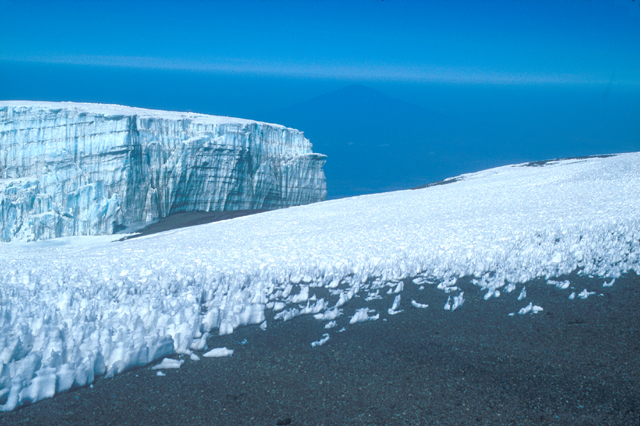 I hadn't expected to see the massive northern glaciers and their green glow till we reached the summit. I gasped and beheld the shocking spectacle. Larry took videos of our reactions to this achievement. The Mountain Madness staff applauded us and high-fived us all. We posed for dozens of pictures. I couldn't find my hat and I was getting sunburned and I was afraid of the wrath of Helene when she saw my burned face. 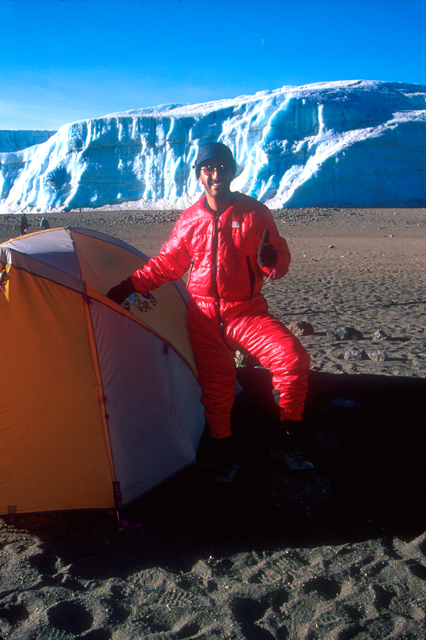 We walked another 20 minutes to our summit crater camp and continued to marvel at sight of the glaciers. 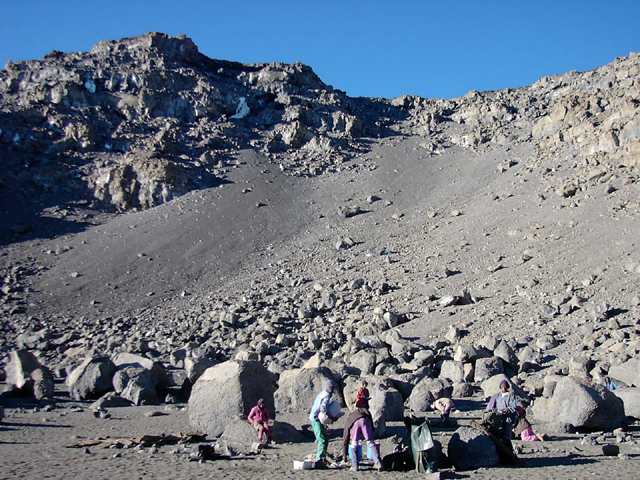 Just as all with all our previous camps, we were the only group camping on the crater. Larry put on his red down jumpsuit. He showed us the bonus trap doors in front and in back to make going to the bathroom easier. I learned later that day that both Peter and Morgan were having some trouble on the rock wall. Peter said he was dizzy and wasn't thinking clearly and asked Helene if he was getting cerebral edema. Helene was worried that Peter was "pulling a Brad" (only those of you who have read my second Mt. Whitney account will understand what that means.) Helene broke out her "dex" and treated him with 8 mg. Morgan was also having trouble, so Helene gave him 8 mg. as well. Dinner was fried rice with vegetables and ramen soup. That was it. Nothing else. Deirdre and I were wondering when the next course was going to come out. Thank goodness Andy brought along a Kilimanjaro-sized Toblerone bar. Whew! We almost panicked there for a minute. Someone mentioned how amazing it was that the porters carried up the mess tent and all of the chairs and all of the dishes and flatware and serving pieces. Someone else added that the porters were probably glad that we had depleted the food supplies because that meant they had less to carry. Helene and I decided to wear all of the clothes to bed that we were going to summit in so we would have less work to do in the morning. We spent way too much time discussing whether we should wear the poly-pro layer followed by the waffle layer, or the poly-pro layer followed by the fleece layer. These were the tough, tough decisions that we faced.